CHEAPSKATE MAID EMPLOYER! "WASH DISHES WITH ONLY SALT, THEN COMPLAIN SMELLY!" A foreign domestic worker shared her experience working in cheapskate homeowners that have money to employ maids but don’t have money for basic necessities. 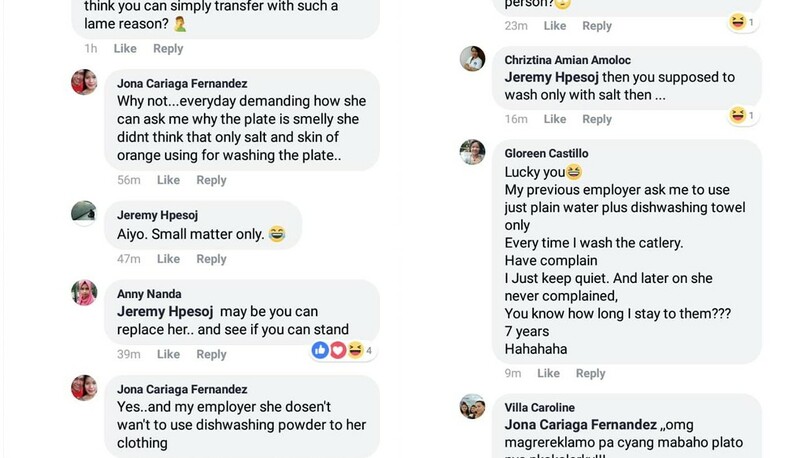 One of the workers mentioned that she is only allowed to use orange peel and salt to wash dishes. Yet she get complained that she did not clean it properly. Whats worse is she is only allowed to wash clothes with water and was told off saying that the clothes are smelly. Got money hire maid no money buy basic stuff. I wonder if the owner even allows the maid to use toothpaste. What a fking disgrace. Previous ArticleBILL SHOCK! SP GROUP BILL OVER $500 WITH NO AIRCON!